(Houston, Texas - Wednesday, March 9, 2016) - Bravura, the only winner of two stakes races at the 2016 Sam Houston Race Park Thorouhbred meet, was named 2016 Horse of the Meet. Bred and owned by Victoria Ashford of Dallas, Texas, Bravura is a three-year-old son of Early Flyer out of the Hadif mare Coryphee. Trained by Bret Calhoun, the chestnut colt broke his maiden at first asking last June at Lone Star Park and competed in stakes at Monmouth Park, Retama Park and Remington Park. 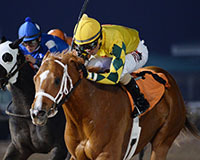 Calhoun sent Bravura to Sam Houston Race Park, where he won the $50,000 Groovy Stakes on January 23 and lived up to his heavily favored status in the $75,000 Jim's Orbit last month. Jockey C. J. McMahon guided the chestnut colt in both wins, and his time of 1:10.59 in the Jim's Orbit was one of the quickest times of the 2016 Sam Houston Race Park meet. "I am thrilled as so many outstanding horses ran in Houston this year," said Ashford. "Bravura was foaled at Valor Farm, and I remember seeing him the day after he was born. He is a very sweet horse, almost like a puppy dog. I share this with Bret; we have worked together through thick and thin and stayed loyal to each other." Bravura's career record stands at four wins from eight career starts and earnings of $139,752. He is a half-brother to 2014 Sam Houston Race Park Horse of the Meet Triumph and Song. Calhoun said Bravura will get a 60-day break, and options are open for his next start. The leading owner, trainer and jockey awards were also presented on the final day of the meeting. Steve Asmussen won his eighth training title at the northwest Houston racetrack, finishing the meet with 28 wins. He was honored as top trainer here in 2000, 2002, 2003, 2004, 2005, 2014 and 2015. Asmussen continues to support Texas racing. He and his family reside in Arlington, Texas, and his parents Keith and Marilyn operate a breeding and training center in Laredo. Asmussen also secured his fourth leading owner title with 13 wins this meet. Stonewall Dominion LLC/Jose Luis Espinoza finished second with eight victories, and Mindy Willis and End Zone Athletics, Inc. tied with six wins this season. "I want to thank all the trainers who gave me such a great opportunity," said Diego. "The support of Steve and George Bryant and my agent, Bradley White, helped me so much. I was hoping for my first leading rider title, and it was not easy with great riders like DeShawn and David chasing me. It means a lot, and I thank God." David Cabrera, who was an apprentice here in 2014 and second last year, finished second again in the standings with 37 wins. The 23-year-old native of Guanajuato, Mexico has leading rider titles at Lone Star Park and Retama Park. Last year's leading rider, DeShawn Parker, finished a close third with 37 victories, and Lindey Wade, leading rider here in 2011, was fourth with 28 winning mounts. Diego won two stakes this meet, guiding the Thievery to victory in the $75,000 Two Altazano for Asmussen and Expect Royalty in the $50,000 Houston Distaff for trainer Leroy Pollok. He will ship his tack to Lone Star Park for its 2016 Thoroughbred meet, which gets underway on April 7. Sam Houston Race Park will host its annual Quarter Horse meet beginning Friday, March 25. The 24-day season will continue through Saturday, May 14 with post times set for Friday at 7:00 p.m., Saturday at 6:00 p.m. and Monday at 1:00 p.m.